In Turbulence by Samit Basu, all of the passengers on a flight from London to Delhi are given superpowers. How this happened is never explained, nor do we meet everyone affected. Not everyone is happy with their “gift,” and not just because some people’s powers aren’t that great. It’s a setup that’s common enough nowadays, given the superpower-saturated market. But Basu carries off an exciting, entertaining story that has some new things to offer. 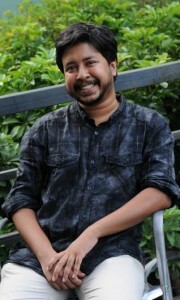 Turbulence is ostensibly about Aman Sen, one of the passengers on the plane. He’s been gifted with an ability that he at first thinks is second-string, but turns out to be a lot more powerful than he initially realizes: he can control the Internet with his brain. He’s the ultimate hacker, and he’s one of the first ones to put together the pieces of his power and realize that everyone on the plane is affected. Aman is a self-professed nerd, so once he figures out what’s going on, his first thought is to assemble a Justice-League-style group of superheroes. His plans are given sudden urgency when he discovers that passengers on the plan have started disappearing, some of them later turning up dead. Aman’s not the only one who’s figured out what’s going on, and he and the others are being targeted. For all that Aman is the central character in the story, the novel itself doesn’t revolve around him. We meet a couple of other characters before Aman, and the narrative switches back and forth from multiple points of view. It’s one of the books strongest points, because it allows us to really relate to all of the characters, even some of the villains, and lends the story some realism. Not everyone is enthusiastic about their abilities. And that’s not just because they might have a stupid, useless, or creepy one. Uzma, our primary female character, doesn’t want anything to do with Aman’s “Indian Justice League.” She wants a normal life – or as much of a normal life as someone pursuing a Bollywood career can have. Her power, which at first seems like a boon to her ambitions, actually stands in the way of her dream. Aman and Uzma have the most interesting trajectories of all of the characters. Not only do they develop and grow with their powers, like most of the other characters do, but they change their minds. They react to the increasingly dangerous situations in ways different than what we’d expect, based on their initial thoughts and decisions about the whole super-powered situation. They also make mistakes, something that’s always a welcome development with superheroes. We want to put these figures on a pedestal, but their stories are ultimately more interesting when we can relate to their human aspects as well. If you were suddenly granted superpowers, would you know what to do with them? Even if you did your best to change the world or help others, on a grand or a small scale, how successful would you be? Could you be sure that you weren’t causing damage in some way? These are just some of the lessons that the characters have to learn, and they give the story a really human grounding that enriches the science-fiction comic-book elements. The action scenes took some getting used to; at first, I found them hard to follow. Our brains are so trained to experience action visually that I kept wishing there were pictures, or that I was watching parts from a movie, during the early action scenes. By the end of the novel, however, I’d gotten the hang of it. That action – which isn’t always physical or literal – makes the book really exciting. There were times I had trouble putting it down to go to bed. That’s why the ending feels like a bit of a letdown; we’re treated to the familiar “the hero’s knocked out, and when he wakes up someone explains to him how the conflict was resolved” trope. It’s a strange choice, given that the book begins and spends significant time in the heads of characters other than Aman. So why do we have to stick with Aman as he’s absent through the climactic resolution? It’s just a quibble, though, and one that isn’t too bothersome as the book’s ending promises more. Although some of the biggest threads might be wrapped up, others remain, and even those that are supposedly tied off might yet become unraveled. There’s no neat bow atop a packaged ending. The best stories end that way, though in Turbulence’s case that may be due, in part, to the sequel, Resistance, that’s coming out next year. It’s already on my to-read list, and in the meantime, Turbulence should be on yours. 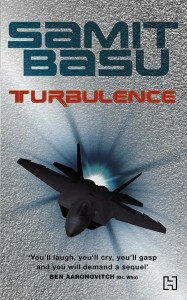 You can find Turbulence on Amazon.